Phillyweather.net: How's This Summer Stacking Up To Last Four (Part Two)? How's This Summer Stacking Up To Last Four (Part Two)? So far, this summer's been known for two things -- a lack of comfortable sleeping weather and a lot of rain. While the number of 90 degree days this year is down from the past three years and our average daily high this summer is the lowest of any summer since 2009, our average overnight lows are the warmest they've been since 2010 over the first 45 days of meteorological summer. Our average overnight low since June 1st is 68.6 degrees, a number that will likely increase as we work through this week's heat. This is 3.5 degrees above average (65.1). It's not the warmest first half of summer at night though -- that "honor" belongs to 2010, which chimes in at 69.8 degrees. If one were to look at just the first half of July though...things are a different story. 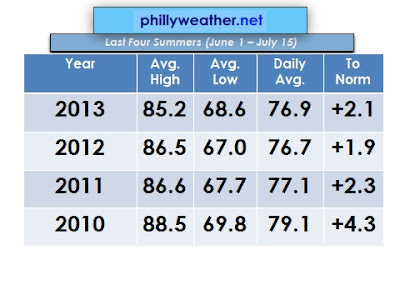 The average low of the first 15 days of July for this year is 74.7 degrees...the second warmest of any first half of July on record. The warmest first 15 occurred in 1993 (75.4), coinciding with a heat wave. July 2013, if we were to hold this pace, would end up with the warmest lows of any month on record....July 1993 tailed off after midmonth. We'll see how we do in holding up the pace in the second half of the month. Beyond the increased urban heat influence that our region (and many other metropolitan areas "experience"), the main culprit for the warmth at night this summer has been the increased moisture in the atmosphere thanks to the persistent southerly southwesterly flow we've seen most of the summer in between a Bermuda High and occasional troughs and upper lows that try to push through. That southwesterly flow has pushed moisture and humidity north northeast. We've mentioned that the Atlantic as a whole is pretty warm...and warmer water thus can influence temperatures and dew point by increasing atmospheric moisture content as the ocean goes through its evaporation process.